Smoke from burning incense fills Mama Avangi’s darkened living room. 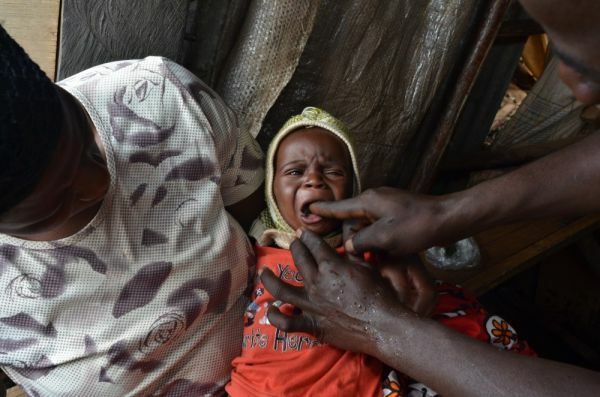 Mama Avangi is a witch doctor in Nairobi. She shows me plastic bags filled with herbs, a thorny sea shell used to blend her remedies and a bottle of salt water from the Indian Ocean. With these simple tools, Mama Avangi says, she can cure anything from headaches to diabetes. In Nairobi, witch doctors, herbalists and other practitioners of traditional medicine are popular counterparts to licensed physicians. 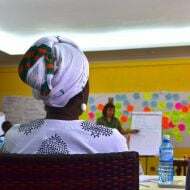 Though traditional medicine is variable and sometimes expensive, it is the primary health care option for many in Kenya’s capital, where rural-urban migrants bring with them the customs of their home villages. Mama Avangi herself is one such migrant. Originally from rural Uganda, she moved to Nairobi with her husband to work as a custodian, but quit her job to take up what she describes as a “gift from god” to heal the sick. She diagnoses patients and prescribes cures based entirely on what she learns from her dreams. 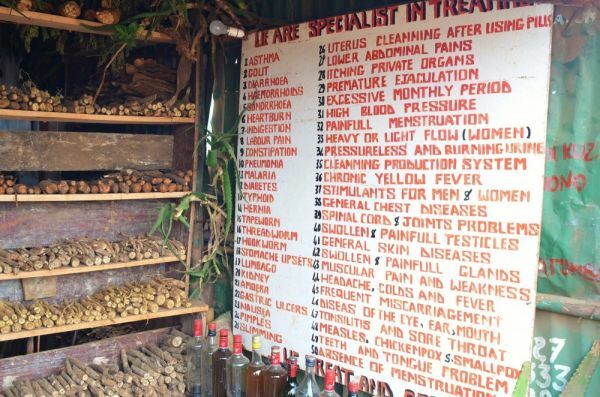 Not all of Nairobi’s traditional doctors employ the supernatural in their practices, however. An herbalist named Charles Owenga, who sells herbs and roots from a storefront in Kibera, dismisses talk of spirits. He learned his craft from his parents and grandparents, who practiced herbal medicine in their home villages. 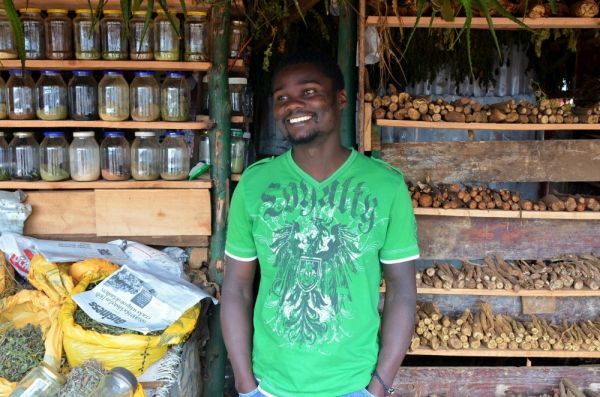 The shelves in Owenga’s shop are lined with sticks and barks and herb-filled glass jars. Strings of fresh leaves and stalks of aloe vera hang from the rafters to dry. He claims to be able to cure at least 50 different ailments — though he won’t treat HIV/AIDS, tuberculosis, or mental illness. Once a week, Owenga returns to his home village in western Kenya to collect plants from forests because his customers — who live throughout Nairobi, from the Kibera slum to the wealthy suburbs — demand the familiar treatments of their upbringings. 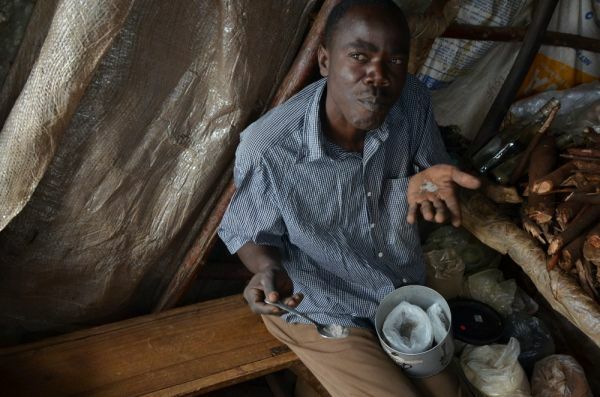 Dalton Odhiambo, a customer in a waiting room of another Kibera herbalist, says he uses traditional medicine because he is sure it works. 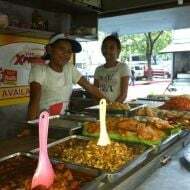 “I had stomach problem and he gave me, like, three to four glasses and I was healed,” he says, gesturing to the herbalist standing beside a row of plastic jugs containing different colored liquids. The jugs are labeled in Swahili for treating malaria, syphilis and other diseases. As Odhiambo speaks, the herbalist pulls a glass from a bucket of water — every patient uses the same glass — and fills it with an orange liquid labeled for treating impotence. He hands it to another male customer who gulps it down and pays two hundred shillings ($2.30 USD). “Bitter,” the customer says after finishing. The herbalists say their most common treatments are for impotence, low libido and menstrual cramps. Dr. Violet Kimani, a researcher at the University of Nairobi who studies traditional medicine, says many people prefer traditional medicine for such “guilt complex” conditions. 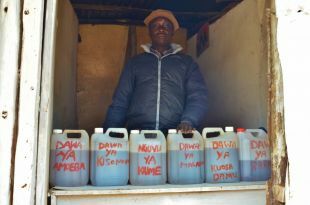 But Odhiambo also likes traditional medicine because he believes it gives more bang for his buck. Each medicine, he claims, cures more than advertised. Alternative medicine also steps in to treat problems that don’t exist. Owenga says many of his male clients come to him to keep up their libido when their wives or girlfriends use birth control due to the myth that the pill causes impotence in men. The one factor that doesn’t seem to play a major role in choosing traditional medicine is cost. In Nairobi’s informal settlements there are many free clinics offering modern medical care, plus low-cost pharmacies where pills cost roughly the same as the herbs. And some herbal treatments aren’t cheap. 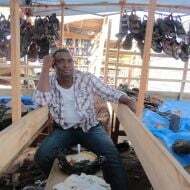 Owenga says his average sale is two or three thousand shillings — as much as a visit to a private clinic — while his most expensive treatment, curing infertility in women, requires two tablespoon size doses of a rare powder costing 15,000 shillings ($175). Dr. Kimani says people are willing to pay such prices when they feel there’s no other option. “For desperate situations like cancers, infertility and others, one may have nothing to lose so they try anything and everything,” she says. And though some treatments have been proven effective, the herbs don’t always work as advertised. 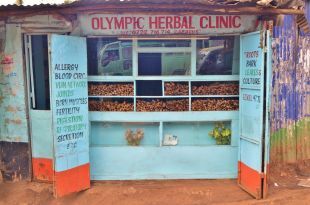 A doctor at a Kibera clinic said 50 percent of his patients try herbal medicine before visiting. 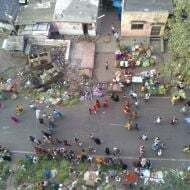 “Most of them have taken the herbal and it has not cured them so they end up coming to the hospital,” he says, which delays proper treatment. He says some patients even come to him to treat the ill effects of bad herbs. 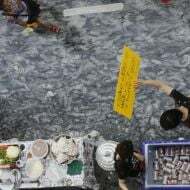 But that doesn’t mean traditional medicine will go away any time soon; faith in herbs has been passed down for generations and its reputation is strengthened today by word of mouth. And Dr. Kimani says herbalists have a role to play in Kenya’s health care landscape because the best practitioners focus on the body and the mind.